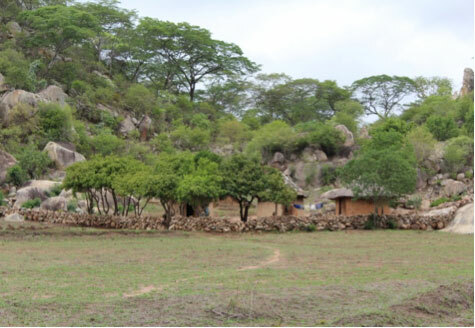 The people involved in Muonde have been concerned with the fencing issue since the 1980s when the late Mathou Chakavanda and others promoted the local experimentation which was then going on with live fencing using indigenous and other species (like sisal and cactus). This was because the community started measuring how much Acacia woodland in particular was being impacted by annual cutting for brushwood fences. Follow-up studies in recent years have found that population growth and the expansion of “bindu” fields into village and grazing land, often as a patchwork of small fields has led to increase in fence length, while shortage of grazing land is driving livestock to make much more determined efforts to break into fields and gardens. This in turn means fences have to be stronger and consequently need more wood to be cut. 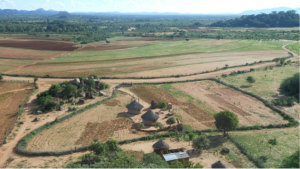 For example studies by the Muonde Team (lead by Adnomore Chirindira) in Mudhomori Village in 2013 showed that the total length of brushwood fences there has increased sixteen-fold between 1985 and 2013 from 2,980m to 48,498m, with an explosion in local fence design from three or four to twenty two different styles (all designed to more efficiently use scarcer brushwood to better keep out animals while only increasing the average dry-weight of wood per metre fencing from 3.95kg to 5.77kg). 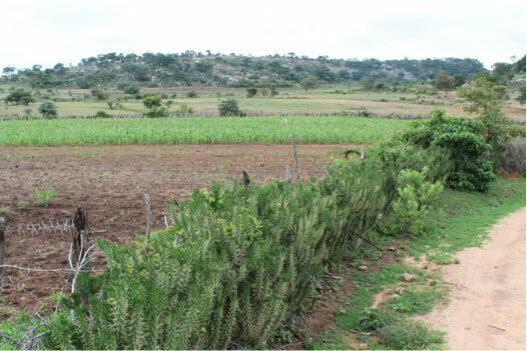 From Chisiya Hill in Mhototi in Feb 2013 the brushwood fences around homes and fields are clearly visible. Meanwhile how long it takes to build one meter of fencing has increased three fold (to 9 minutes) because brushwood has to be cut at increasing distances, loaded into carts rather than just dragged to the site, and then laid out more skillfully in the fences that often now contain posts and barbed wire. The ninety nine homes in Mudhomori village now dedicate an estimated total 7,274.7 hours a year to building these fences (nearly fifty times longer than in 1985), using 288 tons (dry weight) of Acacia and other woodland species; to sustainably grow which requires 11.5 hectares of Acacia woodland according to a variety of local techniques for estimating annual Acacia growth rate, the most interesting of which was the brainwave of the late Sabada Chikombeka. 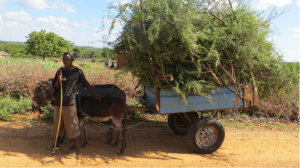 A donkey cart in Mazvihwa heaped with Acacia for brushwood fencing: a skillfully loaded cart can carry more than 50 branches weighing nearly 100kg. While Mudhomori is an extreme case (the total weight of branches used in nearby Manhivi Village has increased a little less than three-fold since surveys in 1988), everyone in Mazvihwa knows the whole system has reached breaking point. People cannot work any harder to fence and anyway there is no longer the Acacia available. And worst of all, livestock still break into the fields and this has become one of the major determinants of harvest (all but eliminating crops in dry years when grazing is scarce and the community herds less rigorously). As MaiJesta and MaiRuth explained to the team goats burst into fields through the tiniest of weak-points and eat on the run, taking out approximately four young cereal plants per minute per goat. A mere ten minute lag between spotting their breaching of a fence and getting them out of the field can result in a 20% reduction in yield. Donkeys are even more dangerous, especially when they have evaded herding and are feeding undisturbed at night. Donkeys can chomp through a field at 5-10 plants per minute while trampling on many others. Therefore even after all the work of building them brushwood fences are not up to the task of protecting fields. Mopane hedge meets basalt stone wall in the Mudhomori field are of Mazvihwa. Sabado Chikombeka learning from MaiTawonga in Mhototi in 2013 about her experience with weaving live Acacia tortilis (miunga) into a barbed wire fence to make it more goat-proof. In the face of these challenges, it is no surprise then that Mazvihwans are innovating. Live fencing, which is growing living plants and fence poles in the fence lines so that they do not have to be cut annually, has been present in this area for decades, but it is rarely possible to produce a live fence that can prevent determined livestock, especially goats. 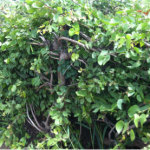 Robby Zeinstra’s experiments with braiding mopane to produce an impenetrable hedge. 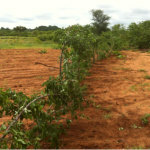 An experiment with planting live fence poles of an easily propagated local fruit tree, Lannea stuhlmannii (musvimwa). Another area of innovation is people attempting to make live fencing more effective by thickening the plants and beginning to “hedge” by weaving plants to block the gaps. A particular effective live fence using an exotic spiny plant protecting a field in Murowa in 2010. Most of the local innovation happening was with indigenous or exotic spiny plants, but a major discovery by local innovator Cleopas Banda and volunteer Robby Zeinstra in 2014 was that the pliable stems of the vigorously copping Colospermum mopane (adaptions for elephant browsing!) make them excellent material for woven and laid hedges which bring new levels of possibilities for livestock exclusion. These types of hedges are therefore attracting attention in areas where there is little stone available. 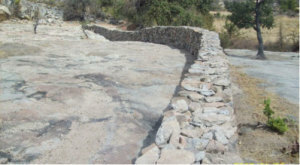 Indigenous innovation: the original Sadzauchi wall that inspired this effort. 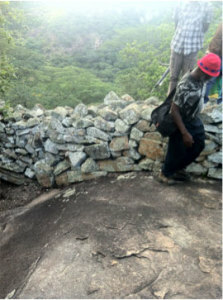 Drystone walling – including approaches with dressed stone – are a tradition in this region of Zimbabwe but one that had been lost. 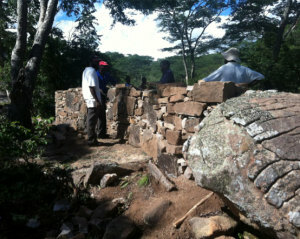 In early 2014 the brothers Spikita – Nehemiah and Britain – who are Muonde team members, began the first effort to build a wall to defend a block of fields from livestock and wildlife in the Madzoke Valley. Their wall was a dramatic success and quickly attracted attention; when one of the women in the valley, MaiMukumbi, built her own section of wall to separate her home, cattle kraal and fields Muonde knew that this was an innovation that would spread. 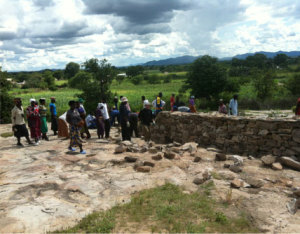 Since no one in the community could replicate classic Zimbabwean stone walling design, and the walls of the innovators were therefore rather crude and unstable (and therefore dangerous to children and requiring heavy maintenance), Muonde decided to invite a traditional stone-waller from the Cotswolds in England through the good offices of Patrick Holden and the Sustainable Food Trust. The volunteer, Paul Nash, who often works on the Prince of Wales Duchy Home Farm, agreed to come right away in March 2014 and discovered not only that his techniques closely resembled those of Zimbabwean tradition, but that people learned astonishingly quickly and with great enthusiasm. This is how it was covered by the BBC. In Mazvihwa the steep hill tops are riddled with rough stone walls erected for self-defense in the increasingly violent nineteenth century. By August 2014 – just five months after Paul’s visit –1400m of new stone walls had been built around the arable farming area in Madzoke Valley and there were others building across the area who had learned from Paul or Muonde trainees, and by Absolom Mutsenhure as far away as the Shashe Block in neighbouring Mashava, where national indigenous farmer leader Nelson Mudzingwa remarked that they were “re-building Zimbabwe”. And delegations started to arrive in Mazvihwa from places such as Chivi requesting training. Paul returned in January 2015 to do some follow-up training and to take the now experienced community wallers to a new level. 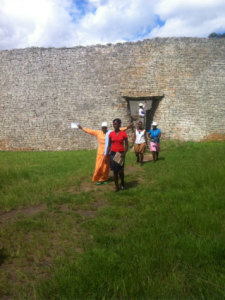 And Nehemiah, one of the original wallers, is now engaged by Muonde to train new communities to build these walls. 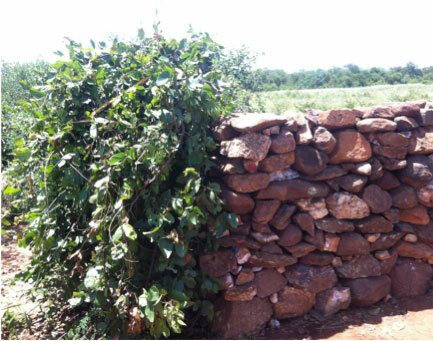 BEFORE: Stone wall built by the Spikita family in Madzoke in 2014 before the training. These walls are significant because they mean that farmers can guarantee exclusion of livestock from their fields, all year round. The herding of animals is very labour intensive and only mandated in these communities during the rainy season, with animals frequently getting loose day or night and breaking into fields. Historically it was done by young men, but these are now in school so that adults – often mothers or the elderly – have to do the work. 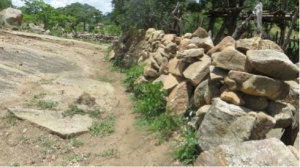 AFTER: Stone wall built by the Spikita family in Madzoke in 2014 after the training. The new walls are more stable, require less maintenance, use less stone and less breachable by goats and wildlife. And they are beautiful. If stock are kept out of fields harvests are secured, and people can grow perennial crops (and easily plant fruit trees), and use their harvested water for vegetables and so forth outside the regular season, while at the same time avoid livestock trampling the ponds and canals. 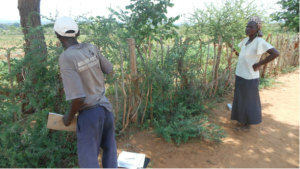 These walls have also proved effective at keeping wild pigs, baboons, porcupines and other crop raining animals out of the fields, including at night. Baboons are intensely suspicious of the walls, which they feel are likely to be a trap, and so for the present this has been a boon for school children who otherwise have to take turns to guard the fields in groups every day all day in the growing season. Both men and women learn wall building with Paul Nash; this is an area where men can take pride in building significant assets for their families, saving women and children huge amounts of livestock herding and wildlife protection time. Drystone walling techniques are also expected to spill over into domestic architecture and other areas of life, both for their cost effectiveness and for their beauty.